Chips have a soft spot in our heart. We all love them. They are crunchy and delicious. Most of us can eat them all day long. Oh! Wait a second. What about your health? They surely don’t have a health-friendly reputation. The dripping oil, extra calories, and the half empty packets don’t go well with the masses. No, no. Hear me out. What if you were told that you can now get crispy, delicious chips without the dreadful fat, calories, and preservatives? Yes, you can enjoy potato chips at the comforts of your home from your microwave. Sounds dubious? For a healthier alternative to packaged chips, let’s introduce you to three best potato chip makers that can help you munch on the tasty chips without any guilt. The Mastrad A64601 Top Chips Maker is a perfect tool for foodie homeowners. With the use of your microwave, it can help you prepare healthy and crispy chips within minutes without the undesirable oil, fats, and preservatives. Not just sliced potatoes, you can use thin layers of fruits and vegetables to enjoy the healthiest chips of your life. The possibilities are endless. You can make apple chips, mushroom chips and so on. Kids would love them too. Just don’t tell them that it’s filled with nutrients and vitamins. The interlocking trays allow you to cook multiple servings at a time. That being said, it’s not really intended for mass production because the tray won’t hold all that much, but nonetheless, you would end up eating a couple of whole potatoes in a single snack session. Overall, it’s intended for home use only. 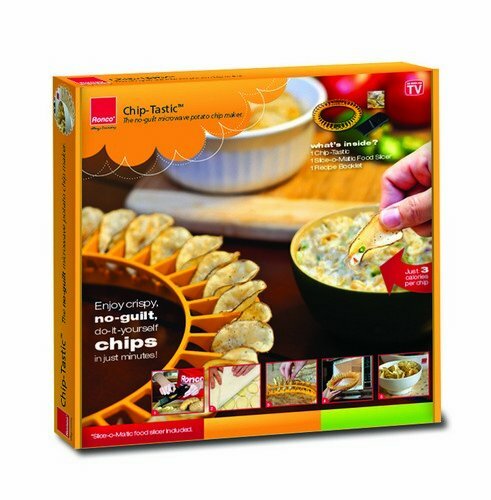 The product is durable, functional, and a go-to choice to make healthier chips at home. Therefore, it tops our list of recommendations. With minutes you can transform a potato, mango, apple, or a pear into delicious, crispy chips. This device can make up to 36 chips at a time using the microwave oven. Included in the deal is a free recipe book that allows you to prepare chips in many different ways. The final results are real potato chips without the unwanted oil, sodium, and chemicals. The product manufacturers state that it takes less than 5 minutes to cook the chips. However, it will take around 10-12 minutes to cook these with a low-powered microwave oven. Since no two microwaves are the same, you might want to keep an eye on the time while cooking them to ensure that you are rewarded with crispy deliciousness once the chips are ready. Made from high-quality plastic, the product is built to last. Overall, it’s a handy gadget for your home that does a good job of offering you a satisfying crunch with fewer fat and calories. 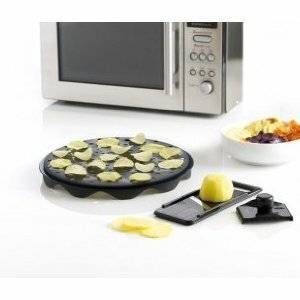 Joie Healthy Potato Chip Maker is another hit product that comes with a slicer, serving bowl, and a microwave tray to help prepare healthy chips at your own kitchen. Simply microwave the bowl with thin slices of sweet potatoes and get ready for a delicious snack that most Americans love. The best part is that there is no uneven heating. It’s crispy from all sides. The product is made available in different colors. 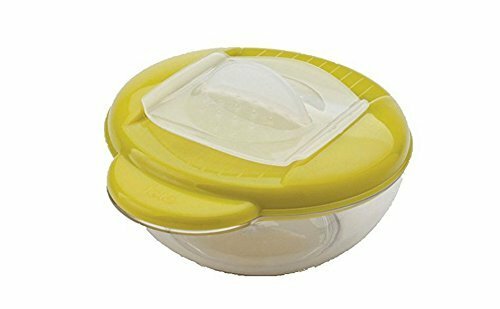 The lid is pretty solid, and it facilitates compact storage. Also, the product is affordable and easy to clean. It has received glowing reviews from past customers. Overall, Joie Healthy Potato Chip Maker is worth a shot. It does what it promises, and makes tasty, healthier chips within the four walls of your house.